ASX 200 up 29 to 6329 despite CBA. High 6329 Low 6275. Multi-year high. Early falls on dividends see buyers return. CBA dividend knocks 14 points off the index. 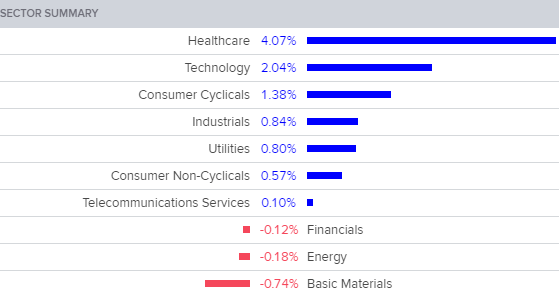 Banks, staples and CSL leads the charge higher. AUD slips further to 72.14c. Bitcoin bounces back to US$6311. Aussie Gold slips to $1646. Asian markets were weaker again with China down 1.67% and Japan down 0.76%. MARCUS CALL – Super fees and a smorgasbord of results reactions. TRADING IDEAS – One stop loss raised. No new trades. SMALL COMPANIES – An insight into CVN which is steadying plus some promising results this morning for AOG, trading at a big discount to NTA. TLT +21.14% surprise takeover announced at NZ230c. SUN -3.03% follows IAG lower today. KGN +4.75% bouncing around again. SM1 +3.19% following A2M higher. IFM +23.23% good results should continue. PGH -21.91% dead. Wrapped in plastic. UPD +1.68% heading to private unlisted co.
JBH +5.82% shorts still covering. Speculative stock of the day: 3D Oil +47.62% update on ‘nearology’ to CVN and Dorado 1. Good volume too. Biggest risers – TLT, MGX, APT, AOG, EHL, CSL and DMP. 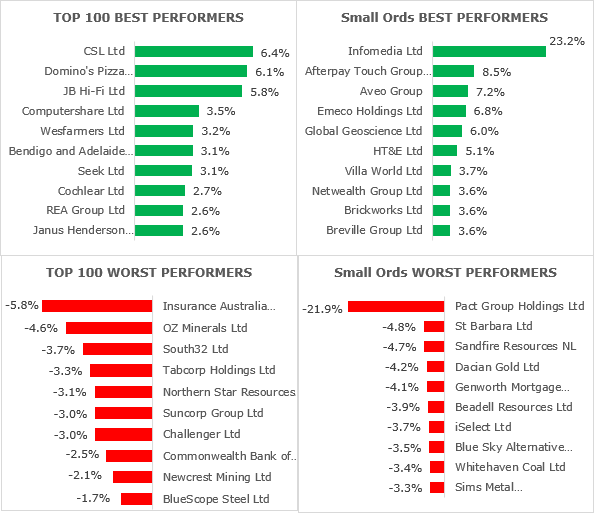 Biggest fallers – PGH, CVN, IAG, SBM, SFR, OZL, DCN and GMA. Computershare (CPU) +3.46% Final results – revenue up 6.3% to $2.247 billion. Net profit of $300 million up 12.8%. Final dividend of 21c up 10.5%. Return on equity of 26.7% up from 25.6%. Net debt reduced by $40 million to $827.5 million. The presentation describes them as “solid results with the fastest rate of earnings growth since 2009. They talk about strong free cash flow self-funding the growth in the company, technology initiatives, strategic investments, debt reduction and enhance shareholder returns. They talk about a positive outlook with 2019 management earnings to increase by over 10% in constant currency terms. CSL (CSL) +6.39% Full year results saw NPAT up 29% YoY to $1.729m, provided in May. Revenue was up 11% to $7.9bn and EBIT was up 33% to $2.4bn. Earnings per share increased 29% to 382c and the full year dividend jumped 26% YoY to 172c per share. FY18 saw 27 new plasma collection centres open, totalling 207 centres, a growth rate unmatched in the US. In the outlook statement the CEO forecast sustained strong demand for plasma products leading to continued margin expansion. In FY19, CSL plan to open between 30-35 new collection centres and forecast modest increases in plasma costs. Wesfarmers (WES) +3.18% FY18 results saw reported NPAT fall 53% to $1.20bn, impacted by the divestment of Bunnings UK and Ireland, and Curragh. Underlying NPAT rose 5.2% to $2.90bn and the CEO called the year ‘one of significant change for the company’ but that the company is now ‘well placed to deliver sustainable growth.’ Net debt was reduced by 17% to $3.6bn and the full year dividend was held constant on last year at 223c per share, fully franked. The outlook statement highlighted that FY19 earnings for the Chemicals business will be affected by WA oversupply of ammonium nitrate. The company also announced Guy Russo, CEO of Department Stores and Target will be leaving and the current Managing Director of Kmart, Ian Bailey, will take on the additional responsibility of CEO of Department Stores and the group CFO, Marina Joanou, has been promoted to Managing Director of Target. Woodside Petroleum (WPL) –0.52%1H18 report. Net profit +6% to US$541m, underlying net profit US$566m +11% with profits affected by the timing of finance costs and exploration expense. Salves revenue +25% to US$1.54bn operating revenue also up 27%. Production +5% on previous half with full 2018 production guidance to be 87-91mmboe. Full Production costs in the range of US$5.50-US$5.80bn. Investment expenditure in the range of US$2.00-US$2.05bn as they target near-term growth. Woodside will focus on growth and construction as they aim to increase production to 100mmboe in 2020. 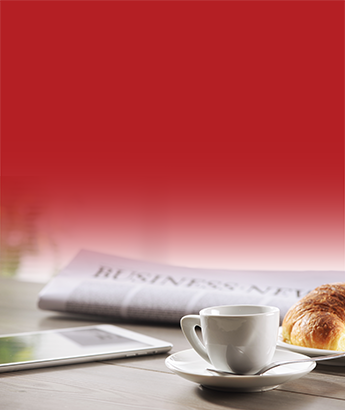 An interim dividend of US$0.53 announced. IAG Insurance Group (IAG) –5.83% FY18 results saw NPAT fall slightly by 0.6% YoY to $929m despite growth in underlying insurance margins to 14.1% this year from 12.4% last year. The fully franked, full year dividend has increased 3% YoY to 34c per share, representing a payout ratio of 77.9%. IAG will also undertake a $529m capital management initiative including a capital return on 19.5c per share and a fully franked special dividend of 5.5c per share subject to shareholder approval. Senex Energy (SXY) –2.04% Oil has been found from the first well of its FY19 drilling campaign in the Cooper Basin. The well is 60% SXY owned and 40% Beach Energy (BPT) owned. SXY also announced it will recognise a $17m one-off gain from the Beach energy transaction and a one-off $33m impairment charge in its FY18 results. Fonterra (FSF) –1.15% Miles Hurrell will take over the role of interim CEO, effective immediately, as the company pauses its new CEO search to review its current portfolio and direction. Miles was previously the group’s COO with the farm source unit and has 18-year’s experience at Fonterra. Fairfax Media (FXJ) -1.69% Revenue for the year ended June 30 fell 3.1% to $1.69bn. Net loss after tax of $63.8m, compared with a net profit of $83.9m in the prior corresponding period. Significant items after tax totalling a $188.7m loss. Dividend of 1.8c (50% franked), bringing total dividends to 2.9c (68.95% franked), a payout ratio of 54%. The outlook is soft with trading in the first six weeks of FY19 H1 saw revenues around 5% below last year. Dexus (DXS) +2.56% Net profit after tax of $1.73bn, up 36.8% on FY17. Funds from Operations (FFO) of $653.3m up 5.8% on FY17. Distribution per security of 47.8c and AFFO per security of 47.7c, both up 5.1% on FY17. Return on Contributed Equity of 7.6% and Return on Equity of 19.8%. Gearing (look-through) of 24.1%. Market guidance for the 12 months ending 30 June 2019 is to deliver distribution per security growth of circa 5%. Seek (SEK) +3.10% Top end of guidance range: Revenue growth of 25%, EBITDA growth of 15%. Underlying NPAT of c.$230m. Record FY18 dividends of 46c (5% growth vs pcp). Strong results reflect benefits of sustained investment and strategic execution. Underlying NPAT (excl. significant items & Early Stage Ventures) of A$229.5m (FY17: A$220.8m). Reported NPAT of A$53.2m (FY18: A$147m of significant items, FY17: A$340.2m, which includes OES fair value gain of $138.7m and other one-off items). Guidance looks positive. Revenue growth in the range of 16% to 20% (FY19 vs FY18). EBITDA growth in the range of 5% to 8% (FY19 vs FY18). Updater (UPD) +1.68% Odd announcement – The company has announced its intention to delist from the ASX and become a private company following investor interest to fund the next stage in USD expansion. Existing shareholders can stay with the company as shareholders in the new entity and the company is conducting a buyback at 125c. Mineral Resources (MIN) –1.06% FY18 results saw revenue up 16% to $1.71bn and EBITDA in line with guidance, up 9% to $507m. NPAT increased 35% to $272m and the full year dividend increased 20% to 65c, fully franked. Results were driven by a 25% increase in lithium direct ship ore sales and a 49% increase in sales of lithium spodumene from Mount Marion. The CEO said the company’s ability to get new services and commodity projects online in record time will see impacts into FY19 and beyond. 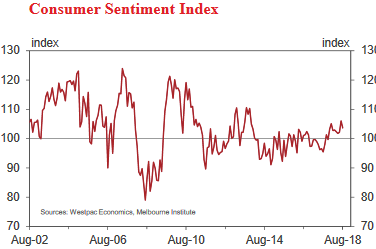 The Westpac Melbourne Institute consumer sentiment index fell 2.3% to 103.6 from last months highs. All sub-indexes were lower, led by a 4.9% decline in the expectations of the economic outlook over the next 12 months. The Australian wage price index rose 2.1% YoY for the June quarter, the same reading as the previous two quarters, meeting consensus expectations. Big trouble in little China as the authorities are clamping down on game makers. Tencent is now ‘eightcent’. Regulators have frozen approval of games, becoming concerned about violence and gambling games. 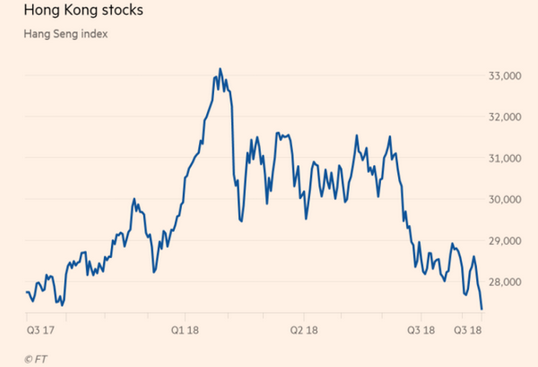 Tencent, the country’s gaming and social media goliath, has shed more than US$150bn in market value since its January peak. Japanese game makers have fallen sharply too. Capcom dropped as much as 6.7% and Konami Holdings Corp. slid 4.7% today. 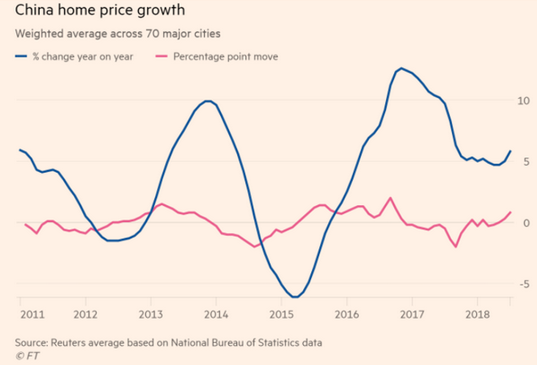 China’s housing prices rose at the fastest pace in ten months in July. Hong Kong stocks down and out in Kowloon. 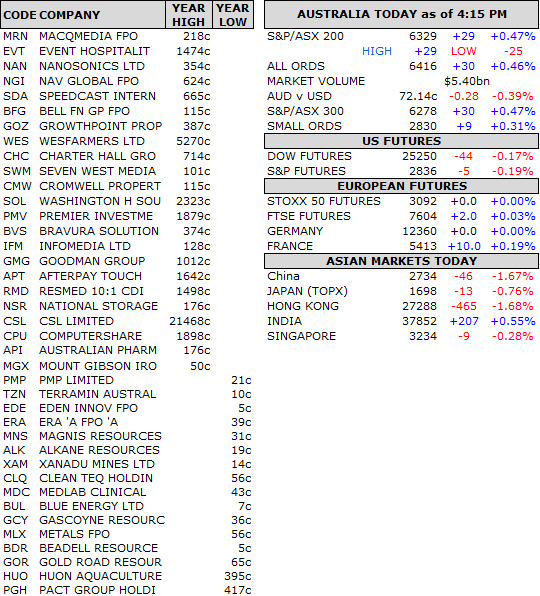 European markets expected to open slightly higher despite Turkey raising more tariffs on US goods. 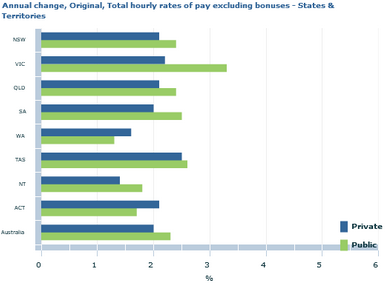 UK bosses pay up 11% to a median of GBP3.9m. 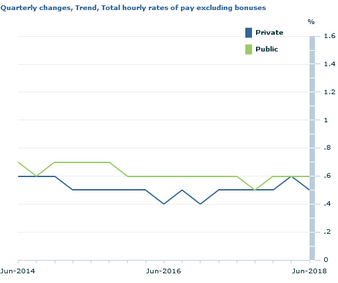 Workers got a 2% rise over the same period. UK Homebase plans to close 42 of its 241 stores as part of a drastic turnaround plan that could leave as many as 1,500 workers out of a job. This is a cracker, the Royal Mail has been fined GBP50m for abusing its dominance in letter delivery. The mail business was floated 5 years ago and has been competing with startup Whistle, formerly known as the less trendy TNT. Henry Jennings has been involved in financial markets for over 35 years as both a trader and a broker in London and Sydney. Starting his career in London trading derivatives and moving to Australia in 1989, Henry eventually settled at Macquarie Group, rising to become a Divisional Director responsible for Equity Trading in Australia. For the last decade, Henry has been involved in private client broking and now writes exclusively for the renowned financial newsletter Marcus Today. Henry regularly appears on ABC TV and Sky Business as a market analyst, commentator and strategist and has presented at various conferences most recently for the AIA on the Gold Coast.